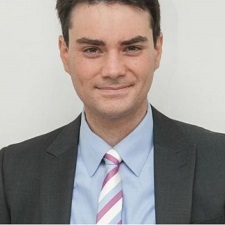 I’m editor-in-chief of The Daily Wire, one of the biggest conservative websites in the country; I’m also the host of “The Ben Shapiro Show” podcast, the most popular conservative podcast in the nation, with a massive young audience. I speak regularly on college campuses. I thought I was going to study music (I was a concert-level violinist before college) and genetics, but when I got to UCLA, I saw an op-ed in the student newspaper that compared the Israeli prime minister to Nazi Adolf Eichmann. I asked if I could write a counter, and they approved; that turned into a regular column in the student newspaper. After about a year, I applied to be syndicated by Creators Syndicate, which didn’t know how old I was (17); they greenlit a weekly column, which I’ve been writing ever since. I’ve always been passionate about values and politics, but I’ve been lucky enough to be able to fight for what I believe throughout my adult life. I’m currently completing a book of insights on the Bible; a guide book for debunking leftist political myths; a novel on Abraham; another novel on the book of Esther; and a novel on one-time German chancellor Franz Von Papen. And I take care of my two children while my wife’s doing her medical residency. My dad received a subscription to the Claremont Review of Books, and when I saw that applications were open for the fellowship, I couldn’t wait to apply. I truly enjoyed arguing with the other fellows over Lincoln’s view of the union, and Bork’s interpretation of Lochner v. New York versus a natural rights view. There were a fair number of now-prominent people in my program, and some of us are still in touch. They are focused on thinking, not just activity. Most programs train you how to be an activist; Claremont teaches you how to think as a conservative, how to consider broad values such as expertise vs. democracy, how to read American history properly. Even solid thinkers come away with a new view of the American story. As an Orthodox Jew, Moses. But that’s a cheap way out. I’d love to have a conversation with Lincoln—he was not only a creative thinker, he was a man who could hold several conflicting ideas at once. I’d order the girliest drink I could think of, simply because unlike a lot of other dudes, I like drinks that taste good rather than like paint thinner—and I don’t care much what other people think about that. Lincoln was probably more important if only because the country was more divided. If Washington hadn’t existed, it’s possible to think of other great men of the time who could have filled a similar role, though he filled it best. Lincoln was in many ways a man alone, attempting to hold together a crumbling society fulfilling the principles of the Declaration of Independence without allowing the destruction of the Constitution. Tribalism from both sides. We’ve walled ourselves into safe spaces, and we’re more concerned about reacting negatively to those we don’t like than actively promulgating a pro-liberty agenda. That means we will often promote what’s useful rather than what’s true, or value what offends the other side rather than what forwards our cause. You’re the author of nine books, including the New York Times bestseller: Bullies: How the Left’s Culture of Fear and Intimidation Silences Americans. Your most recent book, True Allegiance, is a political thriller about the end of the republic. What inspired you to write a novel? Andrew Breitbart was right that culture is upstream of politics, and sometimes you can promulgate messages more easily through character and story than through reasoned argument. There are more acolytes of capitalism thanks to Ayn Rand than thanks to Henry Hazlitt, even though I love Henry Hazlitt. You root for Chicago Bears, Blackhawks, White Sox…and the Boston Celtics. How did you end up a fan of all Chicago teams except the Bulls? I picked up all my dad’s sports allegiances; he grew up in Chicago, but before the Bulls were in town, so he began rooting for the Celtics because he liked Red Auerbach.